For naturally straight haired ladies with locks that refuse to take to curls, this product could be a game changer. This slick black tool makes curling a breeze. No more burning your hands on scorching wands and ceramic plates, no more getting tangled in wires as you twist arms trying to achieve the perfect ringlet. Curl Secret literally does all the work for you. Simply pop a small section of your hair into the barrel, the device will slurp it up, do it’s magic and will then beep at you to indicate your curl is ready to be released. This device is so clever that it can even be automatically programmed to ensure each curl is set in the opposite direction to the last, providing movement and separation. In addition, its anti-tangle technology can leave you feeling rest assured that once your hair is sucked into the barrel, you know you’ll see it once again. At the opposite end of the spectrum to the highly advanced technology of the Babyliss Curl Secret is a classic set of sleep-in rollers. We love these mega bounce rollers, which won’t provide tight curls but will provide a super-glam and voluminous look which is perfect for the party season. Unlike many modern sets of rollers which are now hollow at the centre, these are super squishy so that you can comfortably go to bed with these in your hair. Pop these in your hair when still slightly damp and work from the front to the back of your head, securing each roller into position with a kirby grip. When you wake up in the morning, remove the rollers starting from the back and use a dressing out brush to lightly comb out the curls. Once you’re happy with the style, spritz all over with your favourite setting spray. This is a very affordable tool which creates curls whilst still being kind to the hair. The barrel is infused with Keratin Micro Conditioners that transfer onto your locks as you style, creating shine whilst helping to keep the hair healthy and soft. 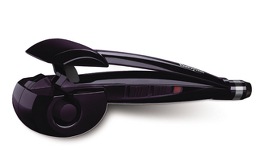 This set of tongs also come with multiple heat settings, so you can control your curl according to your personal stye. Use a higher heat for tighter curls and a lower heat for a more relaxed style. Happy curling everyone, and please do share your top curling tools with us in the comments below.